Airline passenger growth in June 2008 hits five-year low. IATA's international traffic data for June 2008 shows a continued slowing of demand growth for air transport. Cargo contracted by 0.8% compared to June 2007. Passenger demand growth fell to 3.8%, the lowest level since 2003. Passenger load factors dropped to 77.6%, 1.2 percentage points below the 78.8% recorded for June 2007. "The global economic turbulence clearly shows in the 0.8% drop in freight volumes compared to last year. Although the passenger demand grew by 3.8%, this is the slowest growth that we have seen since the industry was hit by the SARS crisis in 2003. With consumer and business confidence falling and sky-high oil prices, the situation will get a lot worse," said Giovanni Bisignani, Director General and CEO of IATA. - Global passenger traffic growth of 3.8% is well below the 5.4% recorded year-to-date. - North American airlines saw demand growth drop to 4.4% (sharply down from the 8.2% growth recorded in May). Domestic traffic in the US contracted by almost 4%. - European airlines saw demand drop to 2.1% (compared to 4.1% in May). Declines in business confidence and industrial production in key European economies may well drive this further down. - Asia Pacific airlines saw their international passenger traffic growth fall to 3.2% in June from 4.5% in May, influenced by weakening long haul destination economies and inflation concerns. - Middle Eastern carriers saw their traffic growth slow to 9.6% June from 12.8% in May. This is sharply down from the 18.1% recorded in June 2007. - Latin American carriers turned in the strongest performance with 12.5% growth. Strong commodity-driven economic growth in Latin America is the driving force. - International freight traffic declined -0.8% in June. This is the first decline seen since May 2005 and follows several months of falling manufacturing sector confidence indicators. - Asia Pacific airlines led the contraction with a -4.8% year-on-year decline for June traffic. - Latin American airlines recorded the largest contraction (12.7%) as the region's cargo sector continues to re-structure its capacity. - European carriers saw freight demand growth fall to 0.7% in June from 1.4% in May. - North American carriers also saw freight demand growth slow to 4.0% in June from 4.6% in May. - Middle Eastern carriers delivered the strongest performance with 12.1% growth (up slightly from the 10.7% recorded in May). - African airlines recorded a -1.9% year-on-year decline in June. "The airline sector is in trouble. 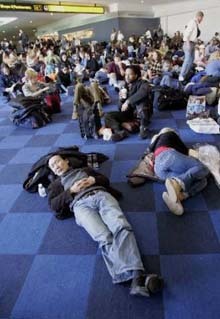 Losses this year could reach US$6.1 billion, more than wiping out the US$5.6 billion that airlines made in 2007. Falling demand and rising costs are re-shaping the industry," said Bisignani. "To survive the crisis, urgent action is needed. Airports and air navigation service providers must come to the table with efficiencies that deliver cost savings. Labour must understand that efficiency is the only path to job security. And governments must stop crazy taxation and give airlines the freedom to merge and consolidate where it makes business sense."